It is no secret that I love these Bride Collections from Barbour. I pick which ones I want to read based on the theme and, usually, a single author that I already know and enjoy. In this case, it was solely an author that had me requesting an ebook through NetGalley. 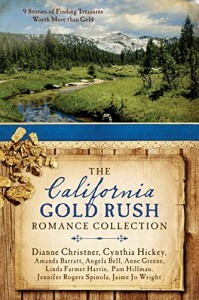 Having previously enjoyed Angela Bell's contribution to the Lassoed By Marriage Romance Collection, I was excited to see what she would do for the Gold Rush theme and how she would take it to England and add her signature twist with well-researched steam based technology. Her story, The Best Man in Brookside, was definitely a favorite as Irishman Donovan returns to England with his fortune in gold, determined to care for his sister and exact revenge on Sophia, the Englishwoman who blackened his name in the village of Brookside. I especially enjoyed how his accent bled into the third person narrative whenever it was focused on his point of view. As with this story, my two other favorites also took us away from the actual mining. Jamie Joe Wright gives us a wounded soiled dove and a rich man on a mission to transform the ghost town she inhabits. Dianne Christner treats the reader to a rough and tumble Clementine whose father hires the Last Resort Traveling Etiquette School to refine her after a potential suitor’s rejection. The other stories continue to entertain with a variety of settings and characters. Amanda Barratt's story tells of two newspaper editors unwittingly in competition for the same promotion. Anne Greene sets her story of a marriage broker determined not to wed and a mortician in Eureka, California. Linda Farmer Harris features a banker and a fugitive, Cynthia Hickey a newspaperman/artist/preacher and a woman forced to masquerade as a boy, and Jennifer Rogers Spinola adds a bit of diversity with her story of Chinese immigrants. In the one story that actually had me saying “Awww,” Pam Hillman takes us into the wilds of California Territory with a surveyor and a cartographer. Overall, another solid collection from Barbour that is entertaining and a satisfying romance read with nine Happily Ever Afters. Definitely would make my top 10, if not top 5 of the Bride Collections I’ve read so far.